The status of the rock lobster Biotoxin Zones in the eastern region remains unchanged. Laboratory analysis results for rock lobster samples collected from the Lower East Coast Zone (Tasman Peninsula) on Monday 30 November have shown that paralytic shellfish toxin (PST) remain at unacceptable levels. Therefore, the Lower East Coast Zone will remain closed at this time. Further sampling of rock lobster from this area will be expedited with the aim of getting results prior to the weekend of 12/13 December. 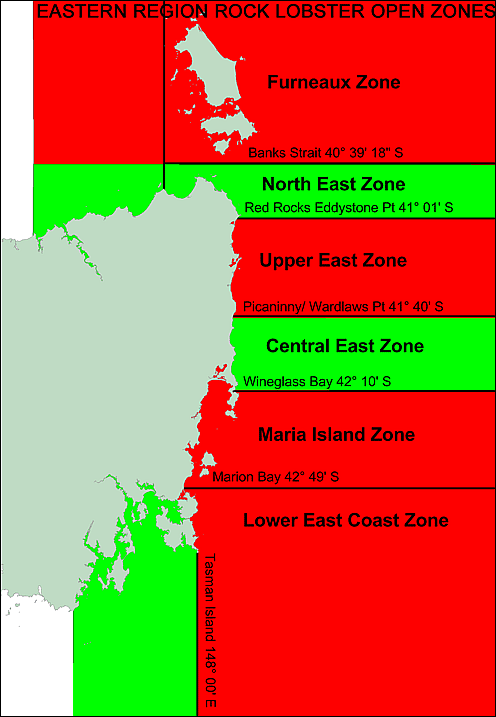 The Lower East Coast Zone (Tasman Peninsula), Maria Island Zone, Upper East Zone (St Helens) and Furneaux Zone remain closed to rock lobster fishing - with no change of status likely before Sunday 13 December.